Two things women don't like to be asked is how old they are and their weight... Well not with these two ladies...they are the true "Ama-san Divers". 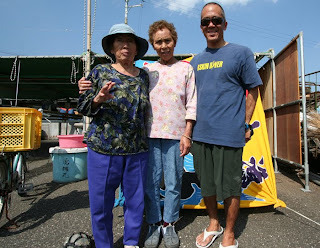 These two inspirational ladies 80 years and 72 years young have given me hope as I filmed them dive for abalone in traditional Japanese style. Having filmed lots of divers targeting various fish, this was my dream trip fulfilled. The real deal...with no spearguns and no fins these two ladies showed me what diving is all about as they had amazing bottom time filling up their bags while competing against each other. We got some incredible footage of them in action and can't wait to start working on the show! We also visited the exact spot where the movie "The Cove" was filmed. If you look closely you can even see dolphins in the net. We met local fisherman and talked with them to get their side of the story and learned a lot about their culture and lifestyle. We had a big group of 18 travelers and everyone was blown away by the experience of a lifetime. Thank you to Kirby-san, Kimura-san, Atsuko-san, Genki-san, Takahashi-san, Ama-sans and our travelers who have made our dreams come true! Team Hokulani just returned from another epic "Mentawai Surf Adventure". Ten local boys from Hawaii scored double to triple overhead surf and came safely. This was their second trip on board the "Naga Laut" and with their Captain, Guide, Cook, Deckhand, and Mechanic they were surfing their brains out. Mentawai's is one of the most consistent surf spots in Indonesia and with over a dozen "world class" spots to choose from it's no wonder why it's called the "Ultimate Boat Trip". Welcome home guys! Hope everyone has been enjoying these variable winds! Weather you surf/dive/fish you gotta love this weather. This weekend, Sunday Oct 11th is the 4th annual Hawaii Fishing Seafood Festival at pier 38. 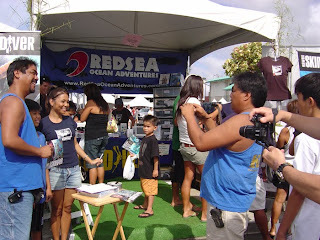 Come down and check out our "Red Sea" booth as we have all kinds of trips, apparel, gyotaku, dvds, and even get your autograph from our TV host of Hawaii Skin Diver, Merlina Garma. She draws in the crowd and last time created a line of people wanting her picture. It's a great event for the family and we look forward to seeing you there! Red Sea Japan adventure begins...We are looking forward to meeting up with our good friend, Kimura-san (midde) at the Yamari Shirasu Factory! They have best shirasu and if you are in the Wakayama neighborhood you must stop by. Our guide, photographer, surfer, diver, entertainer, Kirby Fukunaga will take us deep into the heart of Japan as we seek to meet the ama-san" diver. Relaxing at onsens, eating awesome food, and meeting new friends will be our goal as we embark on this journey to Asia. The sunsets are amazing and with Autumn in full bloom I can't wait to see the fall colors in their landscape and red seas. In Hawaii, one of the big reef game prized fish is the giant trevally "Ulua" and yesterday my friend Erick Itoman got to spear his first Ulua (45#). This was his 2nd dive in a long time time (3 years) and we found a nice cave and to our surprise this fish was just sitting there with no where to go but on the boat. Erick got a good shot and I gave him a back up shot just in case and the rest was history. It was a very special day for me to be there to witness the event. We brought it home and made a print and tonight his family will be eating sashimi. Our friends from Tahiti were in town so we were able to meet up for this dive. The prized catch for tahitans is the "Ume" or what we call the "Kala" surgeon fish. I even shot a flounder which I am looking forward to eating tonight. Have a safe trip back home to Tahiti today and will dive again together.